-Right off the bat, major malfunction in the Pens defense. Little and Burmistrov rush up the ice, plow right through the D, and then find Evander Kane wide open in the back door. Don't know how Kane slipped through undetected, but either way its 1-0 47 seconds in. -Pens get a powerplay. Nothing cooking except a legitimate shorthanded attempt by Atlanta. -Pens spend the next 5-7 minutes constantly forcing passes that just aren't there. About 5 long head man home run attempts that end up as turnovers. -Chris Kunitz finally breaks through the Thrashers D midway through the period. He is hooked from behind but somehow manages to get the shot off. Pavelec stops the shot, but the Pens are awarded a powerplay. -Few seconds later the Pens get to work. Great keep in by Letang and he dishes it to a wide open Crosby who had half the cage to shoot at. 1-1. Streak at 25. -Fleury with 2 incredible saves in a matter of a minute. First one on Slater, and then again on Little. -Thrashers powerplay (common theme of the night). After some average PK work by the Pens, Enstrom dishes it across to a wide open Dustin Byfuglien who blasts it 150000 mph into the back of the cage. 2-1 ATL. 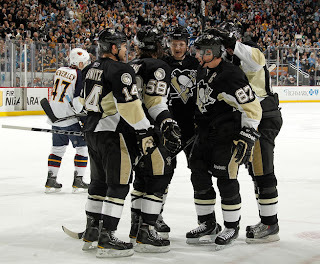 -Pens respond by taking another penalty (Goligoski hooking) but they kill it off nicely. Notes: Pens are lucky to be tied after 1. If Sid wasn't there to bail them out after all that penalty trouble than this one may have taken a totally different turn early. Thrashers came to play hockey, and some locker room adjustments were needed. -Much better looking start for the Pens. -Peverley with a good opportunity 5 minutes in but Fleury was there to deny it. 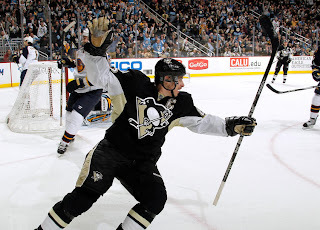 -Malkin with a great chance to score a short while later but just missed the net. -Pens dominating the shots 9-1 through the midway point of the period. -Tyler Kennedy with a golden opportunity to score (especially considering he was playing with 87 and 71) but he whiffs. -More penalty trouble for the Pens, but they respond in a big way. Matt Cooke works the puck away from his man behind the net and places it in front for a charging Craig Adams to put it home. Great work by both! 3-2 Pens. -Paul Martin with a backhand chance that barely catches Pavelec's pads. It would have given Pittsburgh a 2 goal lead with 3 minutes to go in the 2nd. Notes: Much better. It was clearly visible that the Pens were wearing down the Thrashers as the period went on and they managed to capitalize on a great opportunity to seize the game. These penalties are still a cause for concern. -Pens waste no time putting this one on ice. Sid takes the opening faceoff right down the right side and backhand flicks it right to the stick of Kunitz. Bingo. 4-2 in just 9 seconds. -But that doesn't mean the penalty woes are over. Pens stuck killing an extended 5 on 3. Max Talbot takes control of the first shift, and then Adams and Cooke take care of the 2nd. Penalty killed. -Malkin with a breakaway to make it 5 but he is unable to get a good shot off. Hainsey takes out his own net to avoid any rebound. No call. -Arron Asham checks Evander Kane on the side boards. Kane comes up slowly and hobbles off the ice. Absolutely nothing wrong with this hit by Asham. Must have just been a fluky injury. -Cooke in the box again shortly after (3rd time of the night). Thrashers get some shots but nothing even close to beating Fleury. -Burmistrov struggles to take a drop pass from a teammate and Letestu pounces all over him. Letestu actually muscles Burmistrov out of the way before regaining his footing, patiently juking out Pavelec, and stuffing the puck into the net. 5-2. -And the fun continues a few minutes later. Crosby takes a long shot that deflects off the stick of Cooke before beating Pavelec. Fans throw hats because they thought it was Sid's. But he still got 4 points. 6-2. 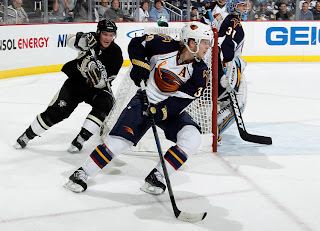 -Eric Boulton scores a late goal for the Thrashers but by that point nobody cared. Notes: The Kunitz goal took absolutely all the air out of the Thrashers and pretty much destroyed any hopes they had of a comeback. Plus, the Pens were clearly the better conditioned team in the 3rd. 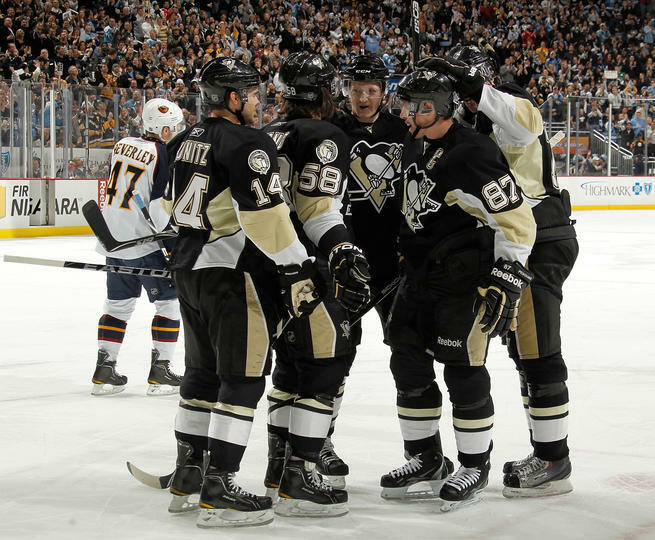 -Matt Cooke played a hell of a game, but something needs to be done about those 3 penalties. -Craig Adams and Max Talbot were the unheralded MVPs. -Zbynek Michalek is a brick wall. -Letang was doing what he does best and that's make plays. -Byfuglien really only had 1 or 2 quality chances, so the Pens did a pretty good job limiting him. -Kennedy needs to play smarter. Shoot if you have the shot. -Goligoski needs to learn defense. -Individual members (well actually just 10 and 18) of the buzz line did well but the line as a whole just didn't seem to be clicking tonight. "I don't need to say any secrets, he's the best..."
-Atlanta may be leading the league in 3rd period comebacks but they were completely sunk by Kunitz's early put-away goal at the 9 second mark.